HudBay Minerals could complete its friendly acquisition of Augusta Resources, parent company of Rosemont Copper, sometime tomorrow, Wednesday, July 16. Augusta's "poison pill" stockholder protection plan expires today. First thing Wednesday, the stock shares tendered by current owners will be sold to HudBay by brokers and before the end of the day, HudBay is expected to own the company. The final deal agreed to unanimously by Augusta's Board of Directors, provides that "in addition to 0.315 of a Hudbay common share as provided in Hudbay's original offer, Augusta shareholders will also receive 0.17 of a warrant to acquire a common share of Hudbay for each Augusta common share, representing consideration with a value of approximately C$3.56 per Augusta common share. The Revised Offer represents a total equity value of C$555 million based on 100% of the fully-diluted, in-the-money common shares of Augusta (including those already owned by Hudbay)." 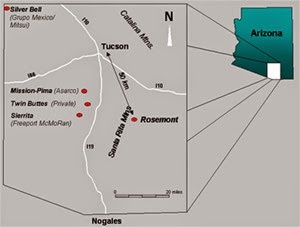 HudBay executives and technical staff have already been in Tucson for weeks assessing the Rosemont property and preparing for the takeover. It's expected that HudBay will honor the commitments made by Rosemont as part of the permitting process, but will transfer staff from their Canadian headquarters and facilities to fill key slots at the Rosemont operation. "will transfer staff from their Canadian headquarters" , thanks for the jobs Hudbay, you're already off to a bad start!